Sara Carson & Hero Headlining the South Bay Festival of the Arts 2019! Get free tickets to the South Bay Festival of the Arts by clicking HERE! Sara Carson, an internationally renowned dog trainer and performer, grew up as a painfully shy child in North Bay, Ontario, Canada. Being around people was difficult, but Sara loved spending time with the family dog – a cocker spaniel named Maple. Around the age of seven, Sara discovered dog training videos on YouTube. She started using what she learned from the videos to train Maple. 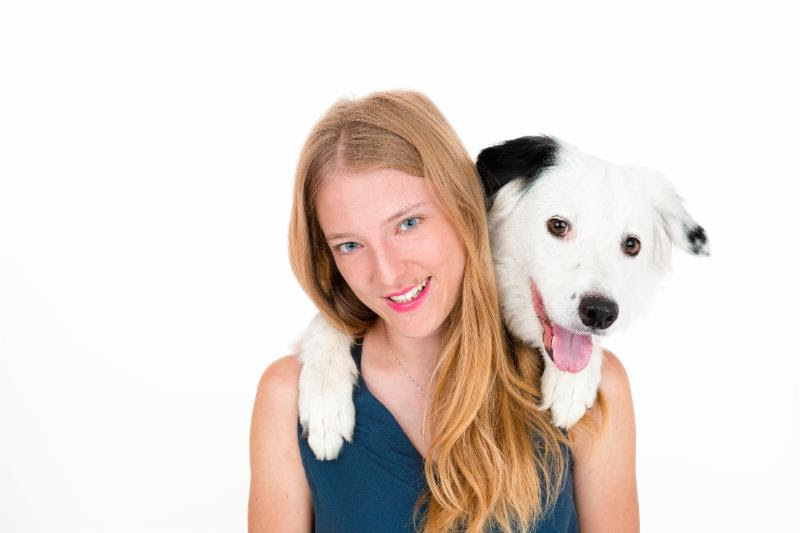 Sara discovered she had a knack for dog training, and, while still young, she started her own dog training business. “I started training when I was about 7 or 8 years old I had a cocker spaniel, the family dog, and I watched some YouTube videos. I fell madly in love with dog training. My parents didn’t like dogs so was only allowed the one. I found a space that I could rent to run my dog training classes. I grew the business from having two clients a month for $20 to having 40 clients a month. It just blew up! I learned it all from online and I kinda got good at it and loved it,” Sara said. Along with her business, Sara got into the “dog sport” world and started taking Maple to competitions. When Maple got too old to compete, Sara happened upon an ad for a border collie who needed a home. She immediately responded, and soon she had a new love in her life, Hero. It wasn’t long before her talent for training – and the adorable Hero – changed her life forever. After bringing Hero home and starting to work with him, she came across a casting call looking for stupid pet tricks – from the Late Show With David Letterman. She wasted no time in reaching out to the casting director and was told that if she could send in a tape of the dog performing the trick, she’d definitely be on the show. Sara spent six months training Hero to blow a bubble when he barked, made a tape of the trick and sent it in – then she and Hero found themselves on their way to New York City. Watch Sara and Hero perform for David Letterman! A promoter saw Sara and Hero on David Letterman, and wanted to book them immediately. As soon as Sara finished high school, she and Hero were off on a new adventure – performing tricks for live audiences all across America. Since then, Sara and Hero (and her other dogs) have been on numerous TV shows, commercials, and reality competitions, including placing 5th during season 12 of America’s Got Talent. Sara, Hero, and Loki perform on AGT. “It was really fun! At first I didn’t know quite what to expect and as we got further along in the competition I started to realize it was a lot of work, pretty much a full time job that took up almost three months of my life! But it was really fun and it was rewarding and I get to continue doing what I love to do,” she said about her experience. It not only allowed Sara and Hero to keep on doing what they love, it allowed Sara to make true connections with a lot of the other performers. These days Sara’s pack has grown to a total of five border collies. She and her dogs continue to travel around performing, and she is still a beloved and sought-after dog trainer. She offers in-person training workshops, has developed online-training, and even has an app! Sara and Hero Coming to the South Bay Festival of the Arts! You’ll have the chance to meet this enterprising young trainer and some of her dogs during the 2019 South Bay Festival of the Arts on June 22nd. They will perform two shows in the Armstrong Theatre and will also do a meet-and-greet so fans can see the adorable animals up close. “When you see Hero or one of my other dogs up on the table, feel free to approach them and start petting them. They’ll probably give you kisses and all that other good stuff,” she said.